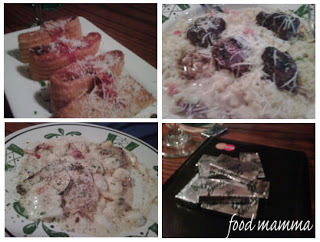 Home » foodmamma » good food, good friends…dinner at olive garden. good food, good friends…dinner at olive garden. It had been a while since we had spent time with some of our dear friends. Life just seemed so busy and weekends were filled with errands and family commitments. Tuesday was the perfect day to get together for dinner at Olive Garden. It had been a while since I had been here and I had forgotten about the wait there always seemed to be for a table. I guess our 35 minutes wasn’t as bad as another group who had been given an estimate of an hour and a half! We started off our meal with warm breadsticks and the signature salad. Q was all over the breadsticks and loved the tangy dressing on the salad. Hubby and I shared the lasagna frittas to start – parmesan-breaded lasagna pieces, fried and served over alfredo sauce, topped with parmesan cheese and marinara sauce. This appy was delicious but also very rich, we couldn’t finish the serving. Our main meal was the new grilled steak fonduta – Grilled lightly seasoned steak medallions topped with caramelized shallot-butter, served with curly mafalda pasta tossed with balsamic onions in a four cheese fonduta sauce. This dish was delicious!! The steak was wonderfully seasoned and the cheesy pasta was the perfect accompaniment. Our friends had the stuffed chicken marsala and the chicken and gnocchi veronese – both of which looked delicious. Sadly I forgot my camera but managed to capture a few fuzzy shots on my blackberry. « brie and chocolate…a decadent combination!